I don’t know about you, but here in the Northeast, the deep freeze of winter has made me want to do nothing but seek comfort under an electric blanket and dive into a deep dish of cheesy macaroni. I also know that face planting in that kind of food will result in a feeling that’s anything but comfortable. This quandary has forced me to peruse Pinterest (like I needed another excuse), break out some old cookbooks, and Google “healthy recipes” till my heart and my tummy are content. That said, I must admit, I do not create many of my own recipes. I’m just a pretty good cook that can concoct warm and healthy dishes based what I read and how much low-sodium chicken stock I have in the pantry. Here’s a list of valuable tips, cookbooks, blogs, and healthy comfort food recipes that fill my house with enticing aromas and make a cold, misty-grey afternoon more bearable. Do NOT balk at the title. I got this as a Christmas present in 2013, and made one recipe a night for two weeks while I was losing baby weight. Her recipes are delicious and easy, and with Valentine’s Day approaching, it won’t hurt to try her truffles. 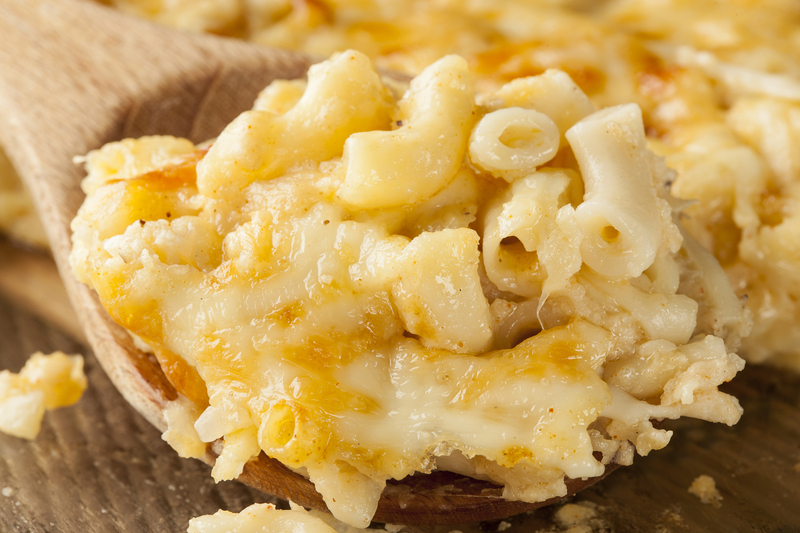 Skinny Mom’s stovetop mac and cheese was exactly what the doctor ordered during the ice storm that hit this weekend. Last weekend I tried the slow-cooker chicken pot pie. You can make any kind of biscuit to float on the top, but the recipe was so healthy, I splurged for a Pillsbury! Quinoa chili from Damn Delicious: Awesome. My family didn’t know it was vegan. The turkey quinoa meatball recipe from How Sweet It Is has gone around my lunch table at work. You can just pair them with a can of low-sodium crushed tomatoes—no need to drown them in jarred sauce. They are incredible—perfect for a weekend with the slow cooker. See above and become friends with your slow cooker. I used to be afraid of mine, eyeing it suspiciously as it sat way up high, on top of my cabinets. “Are you going to burn my house down?” A friend finally convinced me that in 2015, appliances are not arsonists. As I type now, a healthy pot roast is bubbling away, an hour from consumption. I did nothing but dump in the meat, low-sodium beef broth, carrots, onion, celery, garlic, tomato paste, and mushrooms. In an hour, I’ll just whisk some corn starch or flour together with water and add it in to thicken. I also substitute parsnips for potatoes. It works. It can be served with the ever-popular quinoa. Couscous is more popular in my house, and a regular serving won’t hurt. Need a slow cooker? Buy this one on Amazon. Root vegetables are one of the best parts of winter. They are the epitome of hearty and healthy. Parsnips for potatoes also work in stews, and don’t forget yams or sweet potatoes. They can be microwaved in a pinch and are delicious without too many fixings. Some of my best meals have come from throwing veggies in a pot with some chicken and chicken broth. It’s whatever is in the fridge sometimes. One thing I will say is frozen vegetables don’t work as well for me. It can mean extra trips to the grocery store, but the taste is worth it. So as I said, I don’t create recipes; I do what I can to keep my myself, my husband and picky children healthy. It’s not always a huge success (spaghetti squash has yet to be accepted as anything but “ewwww”), but when my husband asks, “Are you going to start cooking healthy in the new year?” I just demure over my steamy dish of parsnip pot roast and give him a sly smile.